THE PARENTS OF a young girl who died in a bouncy castle accident have released statements about their daughter. 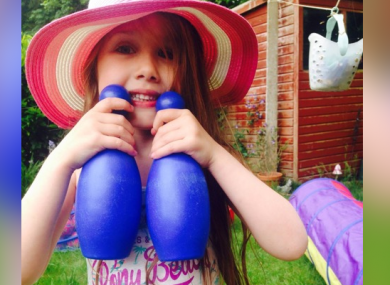 Summer Grant, aged seven and from Norwich, died after an incident at an Easter fair in Harlow Town Park on Saturday afternoon. Words just can’t explain how I am feeling right now, life is just truly cruel. Summer was a bright beautiful and most loving little girl [it's] so unfair that you have been taken, it just doesn’t make sense, I’m truly heartbroken. I never thought our beautiful angel would be taken away from us or that we would outlive her. She was the most happy, polite and beautiful girl in the world. I still can’t come to terms she’s not here. We all love you so, so much, you will always be with us; love you to the moon and back, all our love Daddy, Mummy and family xxxx. Yourharlow.com reported that the emergency services were called to Harlow Town Park just after 4pm on Saturday after a bouncy castle, with the young girl inside, came off its moorings and blew over 150 metres further down the park. Police said that a 24-year-old woman and a 27-year-old man, both from Cambridgeshire, were arrested on suspicion of manslaughter by gross negligence and have been bailed pending further enquiries until 4 May. Detectives from the Kent and Essex Serious Crime Directorate are looking to speak to anybody who has any information or who witnessed the incident. They can be contacted by email – scdappeals@essex.pnn.police.uk – or by calling 101 and quoting incident number 737. Email “Bouncy castle death: "I never thought our beautiful angel would be taken away from us"”. Feedback on “Bouncy castle death: "I never thought our beautiful angel would be taken away from us"”.